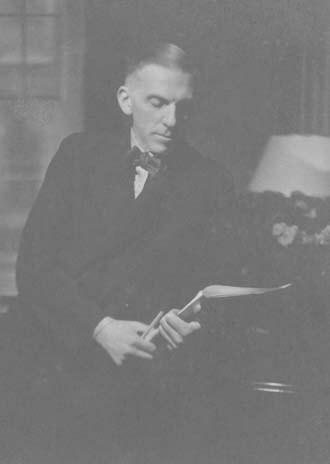 Roger Quilter was known primarily as a gentle and gentlemanly composer of elegant songs. What is less well-known, however, is that he also wrote some lovely orchestral music and memorable piano pieces, that are distinctly impressionistic. He was born at his parents’ home in Hove, Sussex, UK, on November 1st 1877. At that time, his father, a shrewd and extremely wealthy stockbroker and businessman, was still plain William Cuthbert Quilter, but in 1897, Queen Victoria’s Diamond Jubilee Year, he became Sir Cuthbert Quilter, Bart. Sir Cuthbert was an art collector (his collection was well-known in its day) and he owned a very substantial estate in Suffolk, England. Roger was the third of five sons, in a large family. His mother encouraged his artistic inclinations, and he was devoted to her. He attended a preparatory school in Farnborough and in January 1892, he began at Eton College, where, though the emphasis was upon sporting achievement, he was allowed to pursue his musical studies. However, Eton’s atmosphere was not congenial for someone of his sensitivity, and in later years, he was reported to have said that he hated his time there. Around 1896 a family friend suggested that he continue his musical studies in Frankfurt. To go abroad to study was still a common route at this time, since the English music academies were not especially well-established. So Quilter enrolled at the Hoch Conservatory at Frankfurt-am-Main; he took composition lessons with Ivan Knorr, as did Balfour Gardiner, Norman O’Neill, Cyril Scott, and the redoubtable Percy Grainger, though they were not all there at the same time. They had in common a dislike of Beethoven, and they became known as the ‘Frankfurt Group’. On his return, he continued to write songs, having begun while at Frankfurt, and in March 1901, his Songs of the Sea were performed by Denham Price at the Crystal Palace. Gervase Elwes, one of the leading tenors of the day, began to sing Quilter’s songs, and the song-cycle To Julia - which was dedicated to Elwes - put Quilter firmly on the map as a song composer. Over the succeeding years, Quilter continued to write songs for an appreciative audience. He also continued in poor health (his letters are peppered with references to how ill he was feeling), and consequently did not serve in the First World War. Instead, he organised concerts in various hospitals, and a series of chamber concerts that he was involved with continued after the war. Gervase Elwes was killed in an accident at Boston railway station, Massachusetts, in 1921. The Musicians’ Benevolent Fund, in the UK, was set up in his memory, and Quilter was a founder member, serving faithfully and attending the committee meetings regularly until his death. In 1923, he met a young baritone, Mark Raphael, whom he encouraged and worked with closely. He also had a private secretary, Leslie Woodgate, during the 1920s, and both Raphael and Woodgate remained lifelong and loyal friends. In 1911, the children’s play Where the Rainbow Ends was premièred at the Savoy Theatre, London; Quilter wrote the incidental music for it. Produced by Italia Conti, who subsequently founded the Italia Conti School (now the Italia Conti Academy of Theatre Arts), it was immensely successful, and for many years Quilter conducted the opening matinée of the season. The parties for the cast of children, that he held at his home in Montagu Street, London, were also well-known. Most of his best work was produced before 1923, though there are some superb songs produced after this time. He collaborated with Rodney Bennett on a number of projects, including the light opera, Julia, which was premièred at the Royal Opera House, Covent Garden, in December 1936. For many years, his songs were broadcast frequently on radio. He was a nervous, anxious man, cultured, well-read and well-travelled, but not happy with others of his social class unless they shared his love of the arts. His favourite nephew, Arnold Vivian, was killed in tragic circumstances during the second World War; the shock was immense, and was possibly (given Quilter’s nature, the pressures on him as a result of his homosexuality, and other events) the final straw responsible for the triggering of his severe mental illness. In his last years, he was undoubtedly extremely difficult to live with, and there are allegations of blackmail; the events of these years are however open to different interpretations. In 1952, his 75th birthday was marked by the BBC with a celebration concert, conducted by Leslie Woodgate. He died within the year, at his home in St John’s Wood, London, on the 21st September 1953, and was buried in the family vault at Bawdsey church, Suffolk. A memorial concert in London was very well attended by family and fellow musicians, and by ordinary people who loved his music. Quilter wrote mostly songs, but there are a few piano pieces, some orchestral pieces and some incidental music to theatrical works. There are a few chamber works, too: these are almost always arrangements of his other pieces. His music was superbly crafted, and has an iridescent quality. It is often extremely powerful (particularly the Five Jacobean Lyrics - not a quality usually associated with Quilter. The songs always lie well: this is one feature that made them so popular - there were never any awkward intervals - and the accompaniments are closely integrated with the vocal line. A wistfulness tends to pervade all Quilter’s music: it is a very English sound, that we tend to associate with the Edwardian period, but perhaps it stems too from Quilter’s own personality. Because of his early fame as a song-writer, there appears to have been little call for him to write in any other genre. But his other music, though light in nature (he never attempted any long forms), is a delight to listen to, and a joy to play. His piano music in particular is freed of the restrictions of having to write comfortably for singers and their pianists; it is effective and atmospheric, and owes much to Debussy. ‘At a Country Fair’ (from Three Pieces for Piano) has a percussive timbre with hints of Stravinsky’s Petrushka. The Three Studies are still in print, in an excellent volume available through Boosey & Hawkes; the Three Pieces, Two Impressions and Country Pieces are also available from Boosey’s as authorised photocopies. I have compiled an extensive catalogue of Quilter’s works, which is given in my book. Here, to tempt you, I mention a few very select items: either representative of his output, or ones that I particularly like. Love Calls through the Summer Night, from the light opera Love at the Inn which is included in its duet version on both the Naxos CDs mentioned below. A Quilter Compendium (EMI Classics 5 85149 2) which contains a wide selection of songs, duets, choral music, A Children’s Overture, the Suite from Where the Rainbow Ends and Stephen Hough’s exquisite piano arrangements for good measure. As with the Naxos CDs, this is unbelievably good value. Philip Langridge, David Wilson-Johnson, Amanda Pitt and Joanne Thomas, with David Owen Norris (Naxos, The English Song Series, volume 11, 8.557495). This contains the complete folksong arrangements, with many of the songs not recorded before. David Wilson-Johnson and David Owen Norris (Hyperion A66208) - this is only available on LP, alas. The Primrose Piano Quartet (Meridian CDE 84519), playing the piano sextet ‘Gipsy Life’. The Czecho-Slovak Radio Symphony Orchestra conducted by Adrian Leaper (Marco Polo 8.223444). Older recordings (on 78s) to look out for are those that Quilter made with Mark Raphael, on the Columbia label - seventeen songs, and definitive performances; numerous recordings were made of A Children’s Overture and I particularly like George Weldon’s performance, with the London Symphony Orchestra. My own especial favourite is a very old recording, of William Brownlow singing Now Sleeps the Crimson Petal; it is a very moving performance. All Quilter’s recordings (which of course include the Raphael performances, and Quilter himself conducting a selection from Where the Rainbow Ends) have been re-mastered and are on the CD included with my book. I began my research into Quilter’s life and music in 1996, and my book (written with the approval of the Quilter family and the literary estate) was published by Boydell and Brewer, Woodbridge, Suffolk, in 2002. It is a study of all aspects of Quilter’s life and music, drawing on substantial unpublished sources; it includes a catalogue of all his work, and a discography, and most usefully includes a CD of Quilter’s own recordings; you can buy it at Boydell’s website and they will send it worldwide. One chapter is devoted to Where the Rainbow Ends and another to his light opera Julia, which was heavily revised and published as Love at the Inn. For different viewpoints on his songs and English art song of the period, I strongly recommend Trevor Hold’s The Walled-In Garden, 2nd edition, Thames Publishing, London 1996; and Stephen Banfield’s Sensibility and English Song, Cambridge University Press, Cambridge 1985. My PhD thesis on Quilter’s life, music and times is unpublished but is available through library loan facilities, on microfilm. You should be able to get these books through Amazon; or you may find them on secondhand book databases. This British Music site, maintained by Dr Len Mullenger, is an invaluable repository of information about British composers, with links to specialist sites. The British Music Society promotes British music through recordings, live events, and by written publications. It has a worldwide membership, and issues a highly informative, quarterly newsletter, as well as an annual journal. Peter Warlock was a colourful character (to say the least), and here, at the Peter Warlock Society, you can find more about him. Here is the excellent webpage about Percy Grainger which is hosted by the Grainger Museum, Melbourne. Quilter was part of the circle that included Delius; you may find this website on Delius of interest. Cyril Rootham wasn’t part of Quilter’s circle, but he ties in with another of my research interests, Edward Dent. This website has a great deal of valuable information about him. As well as writing articles and giving talks about Quilter, I also have a particular interest in the operas of Michael William Balfe, and have produced performing editions of several of his operas. The Maid of Artois is Rossini-ish and full of delicious tunes and stunning arias; it was written in 1836, as a vehicle for the diva Maria Malibran, and Victorian Opera North-West (UK) recorded it in 2005: a première recording. You can find a review here. For Balfe’s bi-centenary in 2008, I completed a performing edition (working from the original autograph manuscript, and matching the Boosey Royal Edition vocal score) of Balfe’s most famous opera, The Bohemian Girl; the score and parts are now available for hire. Opera Ireland also performed and recorded his Falstaff, and the score and parts are again available for hire. Please go to the hire page of Retrospect Opera for more details. I have also edited Ethel Smyth’s The Boatswain’s Mate, in her reduced orchestration - that’s available for hire too. I’m Dr Valerie Langfield and I am a freelance musician (accompanist, teacher, researcher and composer) living and working in South Manchester, UK. You can contact me - please drop me a line. (If the ‘mailto’ doesn’t work, please note that the address is: rcq@valerielangfield.co.uk.) I always answer requests for information about Quilter, so if you don’t get a reply quickly, either I didn’t get your email in the first place, or my reply has bounced back to me. Please email again, if possible from a different email domain, and include further contact details (a snailmail address would do). It will help if you include ‘Quilter’ in the subject line. If you want to find out more about me and my other musical activities, please follow this link to The Academy of Digital Music Ltd.